Destiny Rewritten by Kathryn Fitzmaurice. Katherine Tegen Books, 2013. Currently available. Face Value: I like this cover, and it fits the book. It looks young, but I think that this book plays best on the younger end of middle grade anyway, so it will appeal to its audience well. Emily is the focus, of the engaging illustration, the books look exciting and hint at the story. I don’t know what the cat has to do with anything though. Does it Break the Slate? Emily is well on her way to being a Slatebreaker, and she shows the necessary self-determination to get there. She is absolutely determined to take her life into her own hands and when she breaks free of the “destiny” she thought she was stuck with, it is an outstanding Slatebreaking moment. Who would we give it to? Literary girls, who will get wrapped up in the romance of a secret in a book of poetry and an adventure to find yourself. If you have a young reader with an interest in poetry (or romance novels, actually), this would be a nice fit. Review: Emily Elizabeth Davis was named after Emily Dickinson. Her English professor mother named her that, believing that it would shape her destiny. So Emily believes that she is destined to become a famous poet, which is ok, but she actually isn’t all that into poetry. What she’s really interested in romance. Particularly the happy endings that she sees in romance novels – she frequently writes to Danielle Steele to ask her opinion about her biggest quandary. She doesn’t know who her father is, and her mother won’t give up the information. 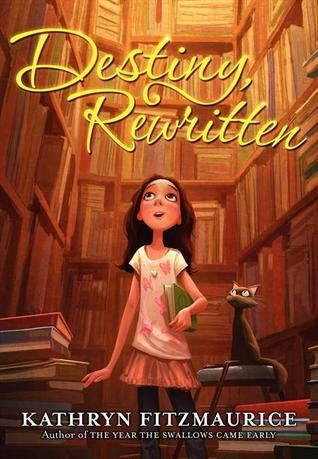 But just as Emily discovers that her book of Emily Dickinson poetry holds the key to her father’s identity, the book is accidentally lost and Emily ends up on a citywide search for her book and the secrets it holds to her destiny. The conflict in the book is pretty mild, and it all wraps up too easily. There’s barely a moment to worry over what might happen – it comes together exactly the way it’s “meant to.” But what is lacking in plot is balanced out by likable characters and some great Slatebreaking moments. It’s also a fight against literary snobbery. Danielle Steel and romance novels are just as valid as Emily Dickinson, and Emily gets to be the person she wants to be and love the literature she wants to love. I can definitely get behind that. This entry was posted in Middle Grade, Reviews and tagged Destiny, Emily Dickinson, Family, Poetry, Romance Novels. Bookmark the permalink.